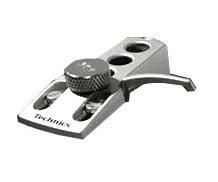 Technics Parts Headshell with Top Weight (Silver) DJParts - All Variety of Parts that DJ Needs. This Technica parts is for use with SL1210M5G Series Turntable, This is include the 4 gram weight. This is the standard head shell included with all Technics M5G series turntables. Also fits MK2, MK3, M3D, MK5 Models & Standard Mount Tonearms from Vestax, Stanton and other brands.